Real life heroes walk among us. They are clad in their everyday uniform, fulfilling their daily tasks – saving lives, rendering services, building homes, among others – to realize their dreams for themselves and their families. Their valor is celebrated in the simplest of things: a warm embrace for the devoted parents to a thank you message for the hardworking Overseas Filipino Workers. 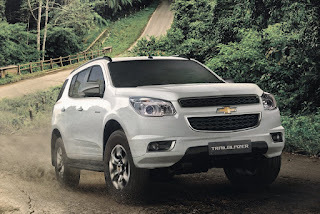 Chevrolet Philippines – The Covenant Car Company Inc. rewards the everyday heroes with a Chevrolet Trailblazer as it launches the My Chevy, My Hero Promo. The promo offers P 100,000.00 cash discount for the Chevrolet Trailblazer LTZ 4x4 A/T and a P98,000.00 all-in low down payment or P 60,000.00 cash discount for the Chevrolet Trailblazer L 4x2 A/T. All-in low down payment includes free 3-year LTO registration, free Chattel Mortgage, and free 1 year comprehensive insurance. The bold and timeless design of the Chevrolet Trailblazer is the perfect complement for the everyday hero. Its smooth ride gives you a comfortable driving experience after a day’s work. The 7-seater SUV has a 2.8L DURAMAX turbo-diesel engine that offers best-in-class power and torque, making it the finest ride for your out-of-town adventures with the family. The Chevrolet Trailblazer also values your hardwork by offering you outstanding fuel efficiency with its 6-speed automatic transmission with manual mode option and advanced CRDI and VGT technology. For Overseas Filipino Workers looking to provide their families with a safe, powerful and comfortable SUV, the Trailblazer LTZ is packed with features and technology that guarantees an excellent and fun ride. The Chevrolet Traillblazer has a Dynamic Driving Technology that includes a number of advanced safety features. It also comes with the Chevrolet MyLink Infotainment System that allows your family to make hands-free calls with you while they are on the road. The MyLink Infotainment System lets them connect their smartphone and other gadgets to also stream music, play videos and view photos. With the Chevrolet Trailblazer, you never have to miss another adventure with your family. The Chevrolet Trailblazer comes with a special 5-year warranty coverage: 3-year bumper to bumper warranty plus a 2-year warranty on the Power Train or 100,000 kilometers, whichever comes first. Owning a Chevrolet Trailblazer also provides additional peace of mind wherever you go as you will be automatically enrolled in the 24/7 Chevrolet Emergency Roadside Support for 3 years, with an option to renew on the 4th year of ownership. The My Chevy, My Hero Promo is until March 31, 2016. The promo is in partnership with BPI Family Auto Loan, Robinsons Bank, Security Bank and Maybank.